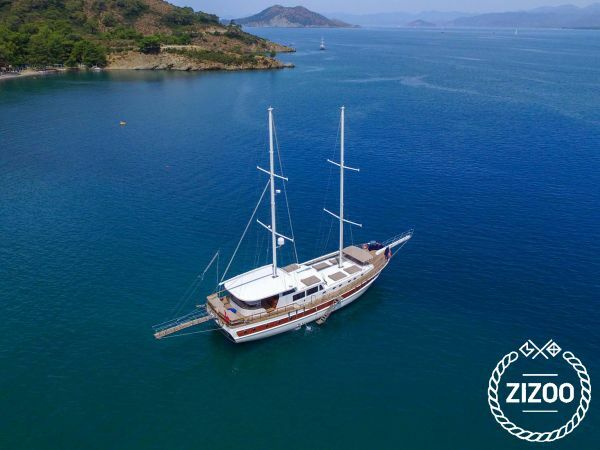 This Gulet Nika 12 is a high-quality Gulet, 24 meters in length, built in 2018. There are modern and spacious cabins. It can accommodate 12 guests in 5 Double, 1 Twin Cabins, Each has a private shower and toilet.and air-condition. There is a fully equipped kitchen, an indoor and outdoor dining area, and an air-conditioned lounge. There is a TV, DVD and music system in the saloon and all cabins. There is also a large sun deck with enough sunbathing mats for all. The crew includes 4 experienced seamen.